It’s quickly become the most hotly contested battle in recent technological history — who produces the best smartphones, Apple or Samsung? There’s no denying that the gap is closing, both in terms of sales figures and consumer perceptions, but just how did this rivalry end up where it is today? Travis McCourt, from financial advisers Raymond James, has kindly put together some rather interesting graphs, depicting the sales history of the Galaxy and iPhone series of handsets. It goes without saying that Apple always had the advantage thanks to its established iPhone brand. 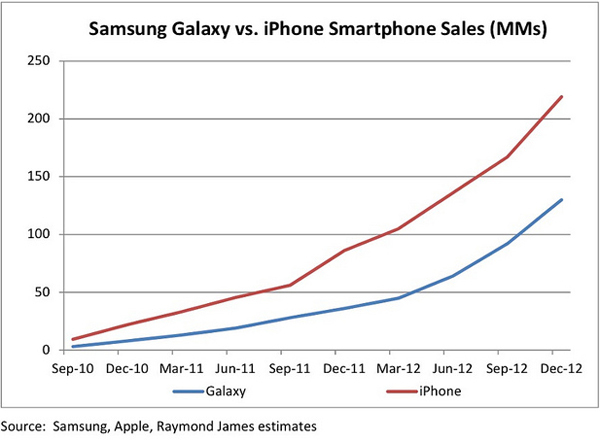 Being first to market saw Apple hold a substantial lead over the first two generations of the Galaxy S series. Whilst it’s clear that Apple is still way out ahead when it comes to month on month sales, the Galaxy handsets have captured more of the market in recent years, demonstrating quicker adoption rates and higher total sales with each new iteration of the series. Even though the Galaxy S2 was a very popular handset (I’m still very much attached to mine) its total sales figures are dwarfed by that of the iPhone 4. It seems very obvious now, but the Galaxy S3 really was the turning point for Samsung, generating as many sales as the Galaxy S2 in just a fraction of the time. Perhaps most interestingly, the Galaxy S3 was selling units almost as quickly as the iPhone 5, quite a drastic change in market behavior compared with the launches of the Galaxy S and S2. Both of these handsets had much slower starts than the Galaxy S3, a telling sign that Samsung’s high end smartphones have only just started to appeal to consumers in the same way as the iPhone. The Galaxy Note 2 has also fared quite well, already matching the total number of sales as the original Galaxy Note. But Apple still enjoys the most rapid sales figures, and doesn’t show any sign of slowing down. The iPhone 4S and 5 both saw much better sales statistics in the first few weeks after launch than any Galaxy product to date. 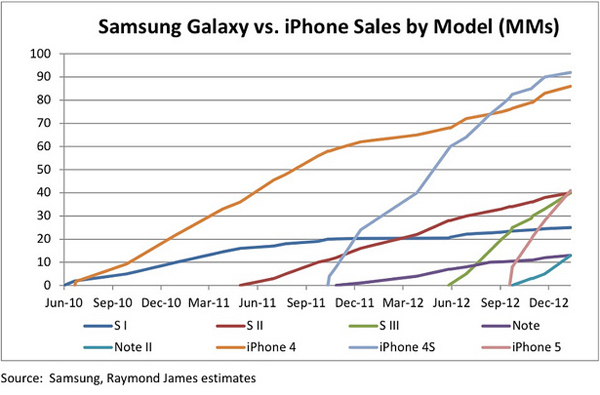 This last chart is by far the most encouraging for fans of Samsung and the Galaxy series. As we’ve heard before, over the course of 2012, Galaxy sales leapt from 9 million to 38 million units each quarter, just about nudging out iPhone sales in Q3 as well. From the looks of the data it seems that the Galaxy S3 launch at the end of May had a direct impact on iPhone sales, leading to the overlap in September. But the launch of the iPhone 5 quickly rectified this problem for Apple, and the company managed to close out the year ahead of Samsung yet again. There are so many questions about the future of the iPhone vs Galaxy war: will the launch of the Galaxy S4 finally see Samsung leap ahead of the iPhone permanently, or will Apple hold off the S4 just like it did the Galaxy S3? What about the next iPhone, could that cost Apple the lead, or will it further cement the tech giant’s lead over Samsung? Sound off your thoughts in the comments.